Since its founding, Ebara Corporation has continued to contribute widely to society through our range of high quality technologies and services. Ebara’s CSR Policy was stablish in 2012, to encourage business with an emphasis on Ebara’s corporate social responsibilities. As a fully owned subsidiary of Ebara Corporation, EPMEF is fully committed and determined to abide by Ebara’s CSR Policy and will be observing proper practices for full compliance in our daily business dealings internally, with our sister companies and associates and our customers. The idea behind Netsu to Makoto (Passion and Dedication) is that members of the EBARA Group shall approach their job with enthusiasm while exercising their creativity and ingenuity, and pursue their work with sincerity and integrity. The EBARA Group contributes to society through high quality technologies and services relating to water, air and the environment. 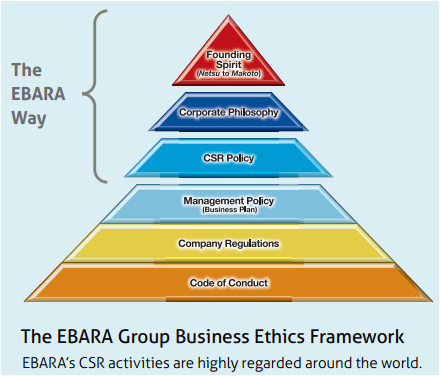 The EBARA Group shall base all business activities on its Founding Spirit and Code of Conduct.